Hanoi (VNA) – Vietnam attaches importance to the strategic partnership with Germany and hopes the two sides will further tighten bilateral cooperation, especially in the fields of economy, trade and investment, a high-ranking Party official stated on March 25. During his reception in Hanoi for visiting Federal Minister for Economic Affairs and Energy of Germany Peter Altmaier, head of the Party Central Committee’s Economic Commission Nguyen Van Binh also expressed his wish that Germany and other member countries of the European Union (EU) will support the EU-Vietnam Free Trade Agreement. 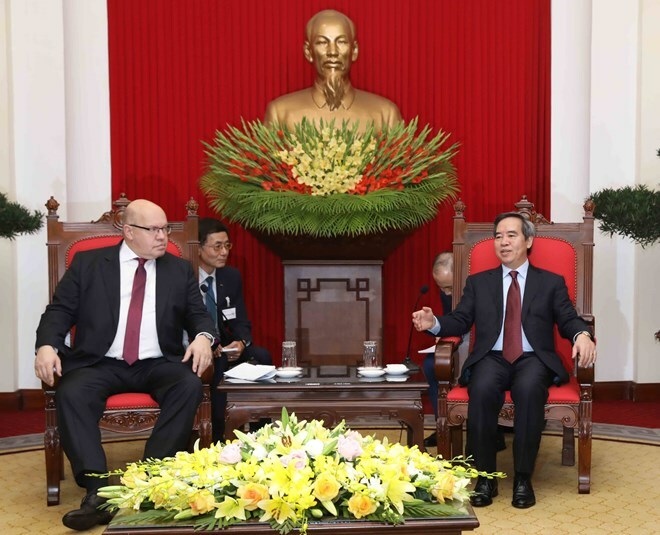 This will mark a very significant progress in the realisation of the EU’s Europe – Asia connection strategy and acceleration of the Vietnam – Germany in particular, Binh stressed. The official described the inauguration and commissioning of the German House in Ho Chi Minh City as a bridge linking German enterprises with their Vietnamese partners, as well as with those in the Association of Southeast Asian Nations (ASEAN), thus contributing to the strengthening of the trade and investment cooperation.